The present study investigates activated teak leaf powder (Tectona grandis) as a biosorbent for the effective removal of Congo red (CR) dye from aqueous solution. Biosorbent was characterized via Fourier transform infrared spectroscopy, scanning electron microscopy, Brunauer–Emmett–Teller and X-ray diffraction. The effect of different parameters, i.e., initial dye concentration, adsorbent dosage, contact time, pH and temperature, was studied in detail. The experimental data were interpreted and studied using Langmuir, Freundlich and Temkin isotherm, and Langmuir isotherm was observed to be best fit. The investigation shows the pseudo-second order is the prevailing kinetic mechanism during adsorption and the energy change (ΔG), enthalpy change (ΔH) and entropy change (ΔS) were − 5.101 kJ/mol, 246.792776 J/mol K and 69.6771398 kJ/mol, respectively. The results show that activated teak leaf powder can be a viable sorbent for the removal of CR dye from wastewater in a reasonable, economical and environmentally friendly way. Paper, textile, cosmetics, food, pharmaceutical and plastic industries discharge effluents containing highly colored dyes which are one of the major causes of environmental deterioration (Forgacs et al. 2004). The effluent of dye industries has various environmental issues which include high chemical oxygen demand (COD), delayed and stagnant growth of microorganisms, light trapping, etc. (Chen et al. 2003; Singh et al. 2013). Decomposition of some dyes present in the effluent leads to health issues due to conversion into carcinogenic substances under anaerobic conditions (Chatterjee et al. 2009). Anionic dye is metabolized to benzidine, a human carcinogen, and causes an allergic reaction (Chatterjee et al. 2010). Congo red (CR) dye is being currently used for various applications such as laboratory aid, pH indicator, histological stains and textile industries (Garg et al. 2003). Dyes are recalcitrant organic molecules, resist aerobic digestion, are low biodegradable and are stable to light (Mondal 2008). Therefore, conventional biological wastewater treatment processes and methods are not enough and prevailing to treat them (Zhou et al. 2012). 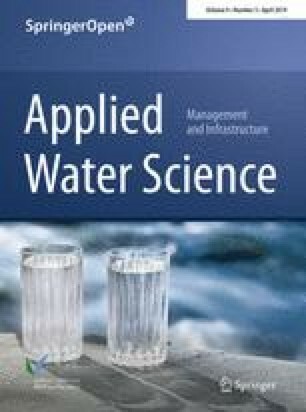 Various physical and chemical treatment processes such as adsorption, oxidation, coagulation followed by flocculation and advanced treatment techniques such as membrane separation, electrochemical degradation, ion exchange etc., can be effectively used to treat wastewater effluent of dyes industries (Gupta and Suhas 2009; Fan et al. 2008). Recently, adsorption is receiving much more attention among other available technologies due to its simplicity, ease of operation, low energy requirement and reuse capability (Silva et al. 2012). Activated carbon is the most efficient and frequently used adsorbent for the efficient removal of water-soluble dyes (Namasivayam et al. 1996). But the high cost and difficulty in regeneration are the main hurdles for its effective and long-term use at a large scale (Nasuha et al. 2011). Low-cost biosorbent was explored in detail by many researchers in developing and developed countries due to its local abundance, low toxicity and inexpensive regeneration. Various materials such as orange peel (Namasivayam et al. 1996), papaya seed (Hameed 2010; Nasuha et al. 2011), jackfruit peel (Hameed 2009) and chitosan (Rouf et al. 2015) were studied for effective dye removal. Adsorption of methylene blue dye (Bhattacharyya and Sharma 2005), Congo red dye (Bhattacharyya and Sharma 2004) and methyl orange and Congo red dye (Ibrahim et al. 2015) using neem leaf powder was studied in detail. Furthermore, basic dye and methylene blue using guava leaf powder (Singh and Srivastava 1999; Ponnusami et al. 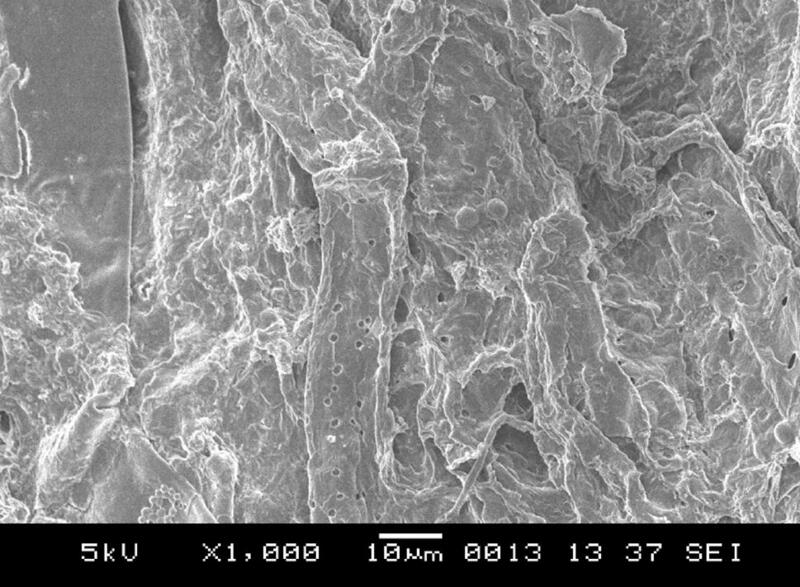 2008) and teak leaf powder (TLP) (King et al. 2006) have also been investigated in detail. However, little research has been done to investigate the potential of adsorption using solid waste from plant leaf powder specifically TLP. The present research work examines potential applicability of activated carbon prepared from TLP as a biosorbent for the effective removal of anionic CR dyes. 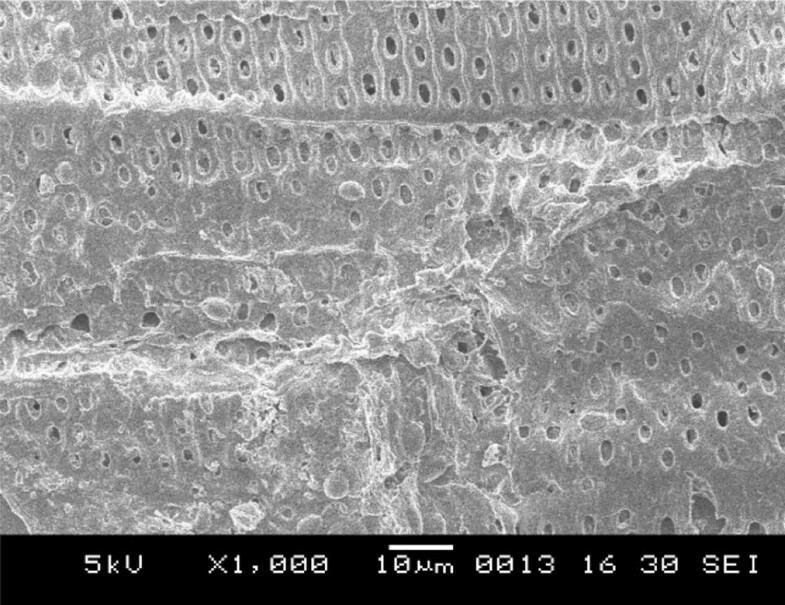 The distinct nature and features of biosorbent were analyzed via Fourier transform infrared spectroscopy (FTIR), scanning electron microscopy (SEM), Brunauer–Emmett–Teller (BET) and X-ray diffraction (XRD). The effect of different physicochemical parameters which include initial dye concentration, adsorbent dosage, pH, contact time and temperature along with adsorption isotherms, kinetics and thermodynamic parameters was also explored in detail. The adsorbent material, i.e., teak leaf (Tectona Grandis), was collected from Nagpur, Maharashtra, India, which favors warm tropical climate for the growth of teak trees. It can withstand extremes of temperature with the maximum and minimum temperature of 39–40 °C and 13–17 °C, respectively. Teak leaves were cleaned with distilled water to get rid of soil and dust and then dried till they become crispy. The dried teak leaves were crushed in a mortar–pestle and were sieved, and the fine fractions were separated. The fine fractions were then thermally activated in a muffle furnace at 500 °C. The prepared sample was named as TLP and was kept in an airtight container for other experimentations without any chemical or physical treatment. The procedure used for adsorbent preparation and activation was performed as per standard procedure (Bhattacharyya and Sharma 2004; Ponnusami and Srivastava 2009; Reddy et al. 2012). CR dye an anionic azo dye [1-naphthalenesulfonic acid, 3, 3-(4,4-biphenylenebis(azo))bis(4-aminodisodium)] used during the study was procured from Fisher Scientific, India (C.I. number = 22,120, MW = 696.7 g/mol. and λmax = 497 nm). Physicochemical properties and chemical structure of CR dye are highlighted in Table 1 and Fig. 1, respectively. During experimentation, exactly 1000 mg/l of the stock solution was prepared by adding 1000 mg of CR dye in 1 L of double-distilled water, and during the initial dye concentration experimentations design, the solutions were diluted from the stock solution. During experimentation, the dye concentrations were analyzed by a double-beam UV–visible spectrophotometer (Shimadzu UV-1601). The pH meter (ELICO model LI-127, India) was used for pH measurement. The distinct properties, surface morphology and features of activated TLP were analyzed via Fourier transform infrared spectrophotometer (FTIR) (PerkinElmer Spectrum-BX USA) and X-ray diffraction (XRD) using CuKa (Rigaku MiniFlex II). Before adsorption and after adsorption, particle geometry and structure were identified and recorded by scanning electron microscopy (SEM) analysis. The SEM of activated TLP was performed using model (6380A, JEOL Ltd., Tokyo, Japan). Furthermore, the surface area of TLP was determined by a single-point Brunauer–Emmett–Teller (BET) analysis using model Smart Sorb 92/93, surface area analyzer. 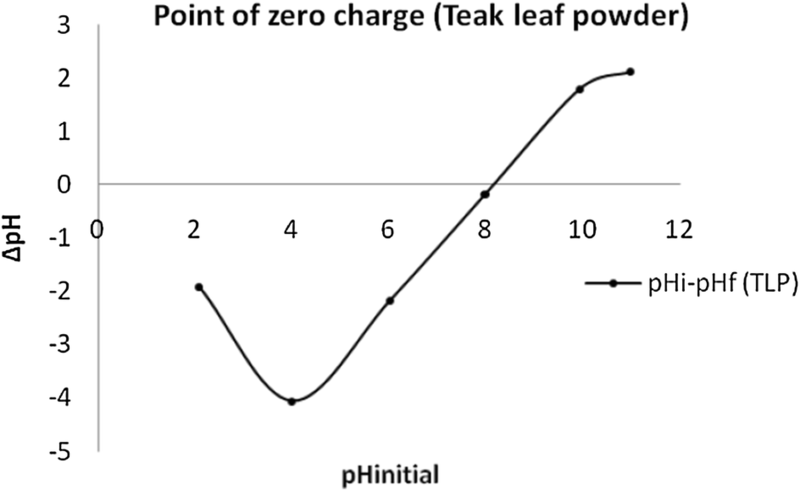 The zero surface charge (pHzpc) of activated TLP was determined by the standard method of solid addition (Ho and Mckay 1998; Reddy et al. 2012; Ribeiro et al. 2012). During pHzpc analysis, exactly 40 ml of 0.1 M KNO3 was used in 100-ml conical flasks. Either 0.1 N HCl or NaOH was added to adjust initial pH (pHi) of solutions (between 2 and 12), and the volume of each flask was maintained to 100 ml by adding KNO3. The initial pH (pHi) was then accurately analyzed by pH meter (Systronics pH system 361 Model, India). Exactly 0.05 gm of activated TLP was added to each flask, followed by secured capping. The solution was kept in an orbital shaker for 150 min (min.) at room temperature and allowed to reach equilibrium. After equilibrium was reached, final pH (pHf) was measured. 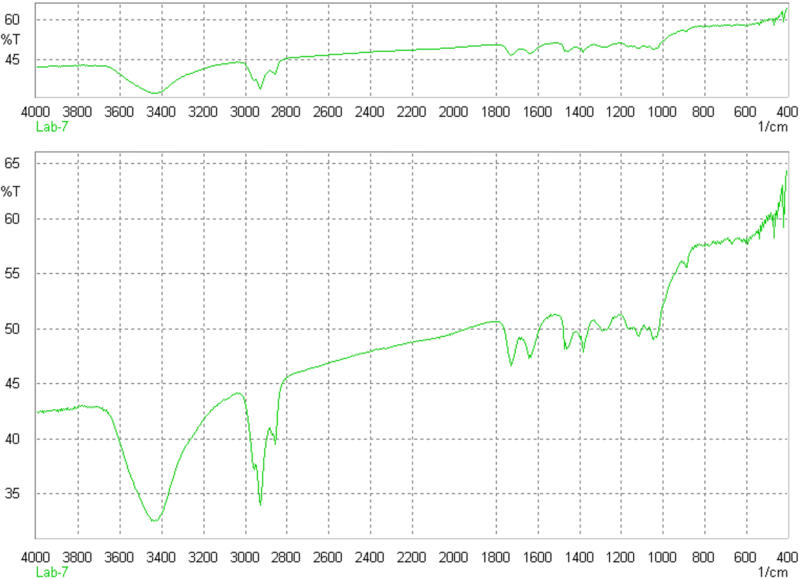 The graph between pH (ΔpH) against pHi was then plotted and the pHzpc was calculated. The effect of different influencing parameters such as initial dye concentration, adsorbent dose, contact time, temperature and pH on the removal of CR dye was studied in detail. During batch studies, 250-ml Erlenmeyer conical flask in an orbital shaker was maintained at 30 °C and 100 rpm for 24 h followed by centrifugation. The batch experimentation was done with a known amount of adsorbent in 100 ml of aqueous CR dye solution. The remaining dye concentration in the flask was measured spectrophotometrically at 497 nm. The effect of pH on the removal of CR dye was analyzed over a wide range of pH (2–10). The pH of the solution was maintained by adding few drops of 0.1 N HCl and 0.1 N NaOH to maintain acidic and alkaline conditions. During the study, exactly 100 ml of CR dye solution of 20 ppm was used with 0.1 gm of adsorbent over the pH range of 2–10. The solution was then centrifuged at 3000 rpm, and the supernatant liquid was used for further analysis. The effect of TLP dose on the CR dye removal was studied by taking 10–250 mg of TLP with 100 ml of 20 ppm CR dye solution and was agitated at 100 rpm for 150 min at room temperature. To study the effect of contact time, exactly 0.1 gm of activated TLP was used in 100 ml of 20 ppm CR dye solution. The solution was then kept in an orbital shaker at pH 6.0 and then analyzed for dye concentration. The effect of initial dye concentrations was studied by adding 150 mg of activated TLP in 100 ml of CR dye solution of 10–100 ppm at constant pH 6.0. The prepared sample solution was then centrifuged and analyzed. Similarly, the effect of temperature was studied at 30, 40 and 60 °C. The solution was withdrawn at a predetermined time after centrifugation at 3000 rpm for five min, and the supernatant was then analyzed spectrometrically. The amount of adsorption at time t, qe, was calculated using Eq. 1.
where C0 and Ce are the dye concentration (mg/l) at initial and at equilibrium, respectively, V is the volume of solution and W is the mass (gm) of adsorbent. The % dye removal was determined using Eq. 2 as fallows. where C0 and Ce are the dye concentration (mg/l). To explore the adsorption kinetics of CR dye, the pseudo-first-order and pseudo-second-order model was adopted to fit the experimental findings using the following equations. These models were selected to study the controlling mechanism of CR dye adsorption from aqueous solution. The Lagergren first-order kinetic model is given by Eq. 3. The pseudo-second-order kinetic model is given by Eq. 4.
where k1 (1/min) and k2 (g/mg min.) are rate constants for pseudo-first- and second-order adsorption, respectively, qe is the quantity of adsorbed dye at equilibrium (mg/g), qt is the dye amount adsorbed at time t (mg/g) and t is the contact time (min). Various theoretical and empirical models were established and studied to characterize the different types of adsorption isotherms. The Langmuir (Eq. 5), Freundlich (Eq. 6) and Temkin isotherms (Eq. 7) were among the most frequently used. During the present study, the relationship between concentration and CR dye uptake was investigated via Langmuir, Freundlich and Temkin isotherms, respectively (Okoli et al. 2015), which is shown as follows. where qe is the quantity of dye adsorbed per precise quantity of adsorbent (mg/g), Ce is the equilibrium concentration of the solution (mg/l), qm is the maximum amount of adsorbent ions essential to form a monolayer (mg/g) and KL is the Langmuir adsorption constant. By experimental data, the Freundlich equilibrium constants can be calculated from the intercept and slope of the linear plot of ln qe against ln Ce. Here, kf is the Freundlich isotherm constant and 1/n is the heterogeneity factor. The Temkin isotherm can be expressed in linear form as shown in Eq. 7. The adsorption data can be analyzed according to the above equation. A plot of qe against ln Ce gives the constants A and B. Here, A is the isotherm equilibrium binding constant (L/g) and B is the heat of sorption constant (J/mol) for Temkin isotherm. During the present investigation, thermodynamic parameters, i.e., free energy change (ΔG), enthalpy change (ΔH) and entropy change (ΔS), were calculated using empirical Eqs. 8, 9, 10 and 11.
where KD is the distribution coefficient, Cs is the concentration of dye solution at equilibrium, Ce is the dye solution concentration at equilibrium into solution (mg/l), R is the universal gas constant (8.314 J/mol °k), T is the temperature (°C) and ΔH and ΔS were calculated from the graph of ln KD versus 1/T as slope and intercept, respectively. All the experiments were performed in triplicates, and mean values were specified. The calculated standard deviation (%) was observed minimal and therefore not represented. All graphs were prepared using MS Excel software. Figure 5 shows the graph of ΔpH versus pHinitial. The Pzpc of activated TLP was found to be 8.1. The result shows that the basic functional groups are predominant on the solid surface of the adsorbent. The pH below this is favorable for adsorption of an anionic dye. The Pzpc of activated TLP is slightly less compared to that of waste processing mustard oil, i.e., pH 9.0 (Magriotis et al. 2014), while it is well above compared to waste radish, i.e., pH 3.4, and jatropha oil cake, i.e., pH 5.0 (Muthusamy et al. 2014; Dawood and Sen 2012). Figures 2 and 3 show the Fourier transform infrared spectroscopy (FTIR), and Figs. 4 and 5 show the X-ray diffraction (XRD) spectrum of TLP before and after adsorption, respectively. 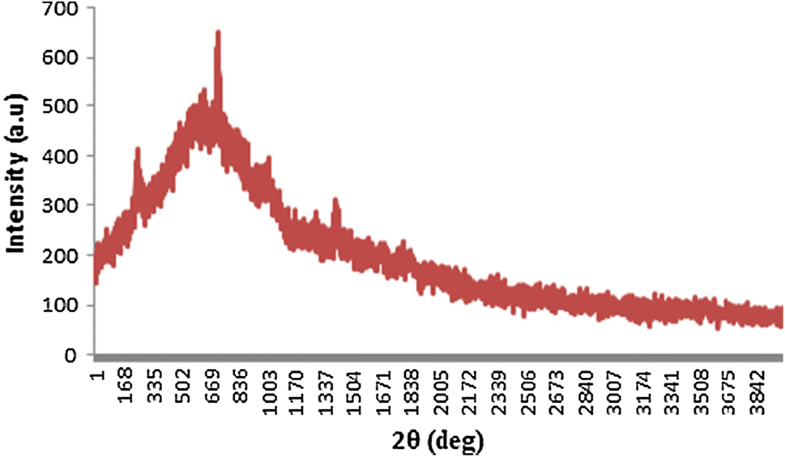 The before-adsorption FTIR spectra show the presence of prominent and intense peaks at 1100 cm−1, 1400 cm−1 and 1600 cm−1, respectively. The peaks confirm that alkene, ether and aromatic carbon rings are present (carbon bond, i.e., C=C) in prepared activated TLP (Hesas et al. 2013). 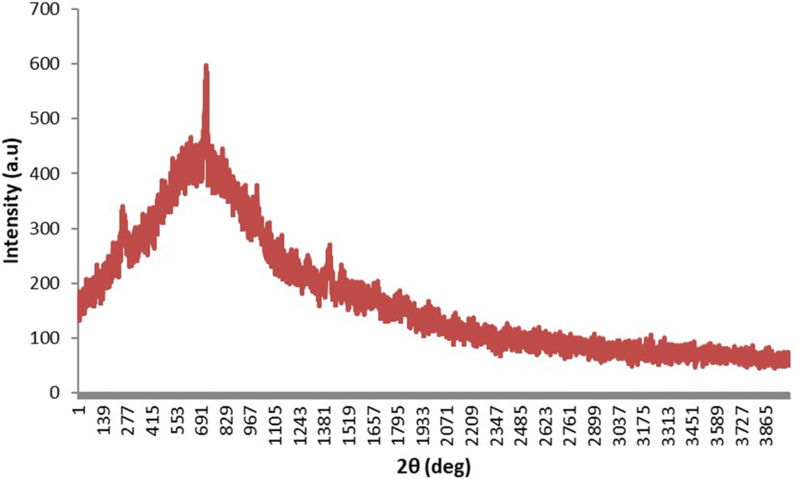 The FTIR spectra after adsorption show the presence of prominent and intense peaks at 1400 cm−1, 1700–1600 cm−1 and 2900–3000 cm−1 which show the presence of alkene, ether, an aromatic carbon ring and C–H stretch from alkanes (Hesas et al. 2013). Similarly, the XRD spectra show the intense and well-identified peak at 2θ degree of 757 which highlight the presence of the crystalline structure. The intensity of the highly organized peaks was not diminished after adsorption as shown in Fig. 5. Figure 5 highlights that the adsorption of CR dye will be on the upper layer of the crystalline structure probably dominated because of physical adsorption. The before-adsorption and after-adsorption SEM images are shown in Figs. 6 and 7, respectively. The results show flex-like geometry having uniform pores (macropores and micropores) on the surface of TLP before adsorption. The pores formation may be due to the carbonization at high temperatures (Fig. 6). After CR dye adsorption (Fig. 7), the pores of TLP are filled due to the adsorption of CR dye which may confirm the adsorption phenomenon between the CR dye and TLP. Furthermore, the single-point BET surface area of TLP was found to be 26.35 m2 g−1. The surface area was measurable and was mostly due to the presence of pores on the surface of TLP (Fig. 8). The pH is a master variable for adsorption on adsorbent. Studies show that the CR dye solution changes its color from dark blue to red at acidic pH and alkaline pH (10–12), respectively (Kaur et al. 2013). 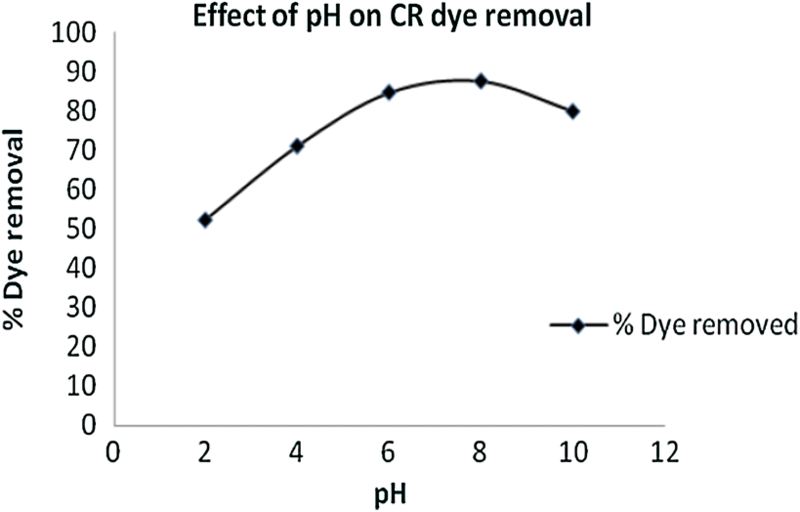 Therefore, the effect of pH on CR dye removal was studied at pH of 2–10 as shown in Fig. 9. 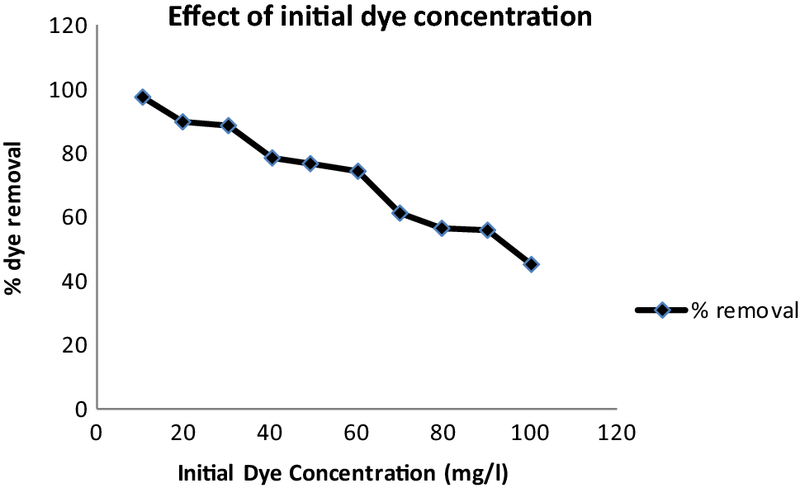 Figure 9 shows that the amount of dye adsorbed was increased from pH 2 to 6, slightly decreased from 6 to 8 and then kept decreasing up to pH 10. This was mostly attributed due to the Pzpc of activated TLP which was observed to be 8.1. When solution pH is less than the Pzpc of activated TLP, sorbent surface will have a net positive charge. This charge facilitates electrostatic attraction between negatively charged anionic CR dye and positively charged sorbent surface; therefore, percentage removal of CR dye increases (Kaur et al. 2013; Ibrahim et al. 2015). The adsorbent dose effect on the removal of CR dye is shown in Fig. 10. Figure 10 reveals that removal of CR dye increases to a certain limit, i.e., 150 g, and after that, there is no significant removal. This may be mostly due to a conglomeration of activated TLP as there is no significant increase in the effective specific surface area and adsorption sites. 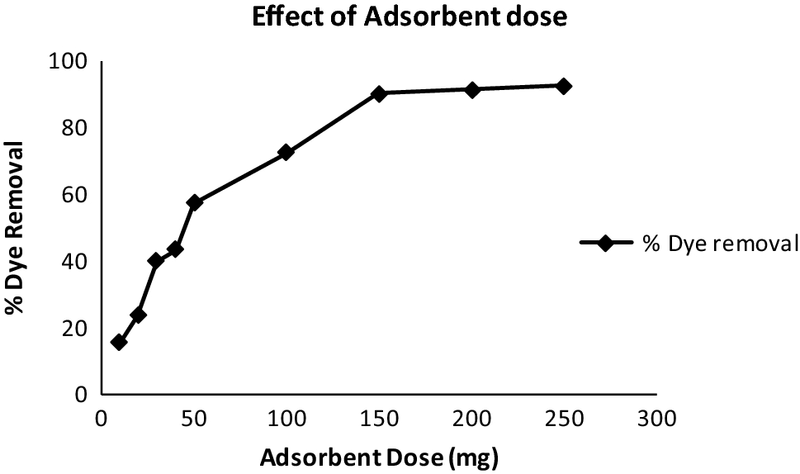 Furthermore, an increase in adsorption with adsorbent dose was attributed due to the increased surface area and the availability of more adsorption sites (Hameed 2009; Reddy et al. 2012). Thus, 150 mg was taken as the optimum adsorbent dose for further study. The initial dye concentration, contact time and temperature have a substantial effect on the removal of CR dye from aqueous solutions, which are shown in Figs. 11, 12 and 13, respectively. It can be observed from figures that CR dye removal efficiency of adsorbent decreased from 89.99 to 45.16% with an increase in dye concentration from 20 to 100 mg/l and maximum CR dye removal was observed at 20 ppm. The variation is mostly attributed due to aggregation of CR dye particles at higher concentration (100 mg/l), which makes it difficult to diffuse through micropores of adsorbent (Bhattacharyya and Sharma 2004). The effect of contact time on adsorption of CR dye on activated TLP was investigated at the optimized condition. 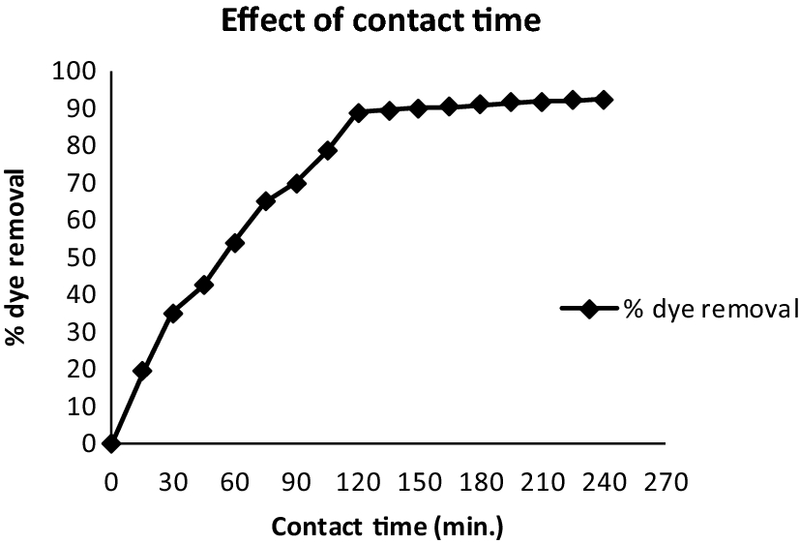 Figure 12 shows that adsorption efficiency increased from 19.28 to 89.99% as the contact time changed from 20 to 150 min and became constant thereafter (Azhar et al. 2005) and the equilibrium was attained within 150 min. Similarly, the adsorption of CR dye on activated TLP increases from 89.47 to 99.27% with a subsequent increase in temperature from 30 to 60 °C, which indicates the endothermic adsorption process. Due to an elevated temperature, the mobility of CR dye increases with an increase in some active sites for adsorption (Salleh et al. 2011). Furthermore, the adsorption capacity for CR dye was observed to be 33.33 (mg/g) for Langmuir isotherms which was found to be substantial. The comparative analysis and adsorption capacity of different adsorbents are given in Table 2. Therefore, after comparative study, it can be observed that TLP can be a good biosorbent for the removal of CR dye. The interaction between adsorbent and adsorbate can be very well described by adsorption isotherms (Abdelwahab 2008). Various mathematical models can be applied to explore the experimental findings of adsorption isotherms. During the present study, the adsorption of CR dye on activated TLP was modeled with the Langmuir, Freundlich and Temkin isotherms so that the mechanism and affinity of sorbent toward adsorbate can be studied in detail (Namasivayam and Kavitha 2002; Ponnusami and Srivastava 2009; Reddy et al. 2012). The different parameters for Freundlich isotherm were obtained from linear correlations of ln qe versus ln Ce. From Freundlich isotherms, kf, n and R2 were observed to be 10.968, 3.367 and 0.950, respectively. It was observed that the value of n is greater than one, which indicates that adsorption is favorable (Pathania et al. 2016). The value of 1/n, a heterogeneity factor, lies between 0 and 1 and the R2 value is shown in Figs. 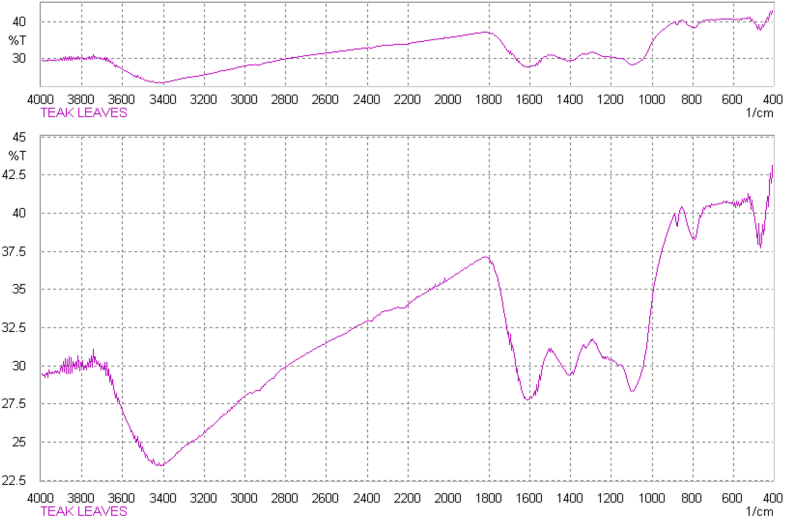 14, 15 and 16, which shows that Langmuir isotherm model was the best fit as compared to Freundlich isotherm model. 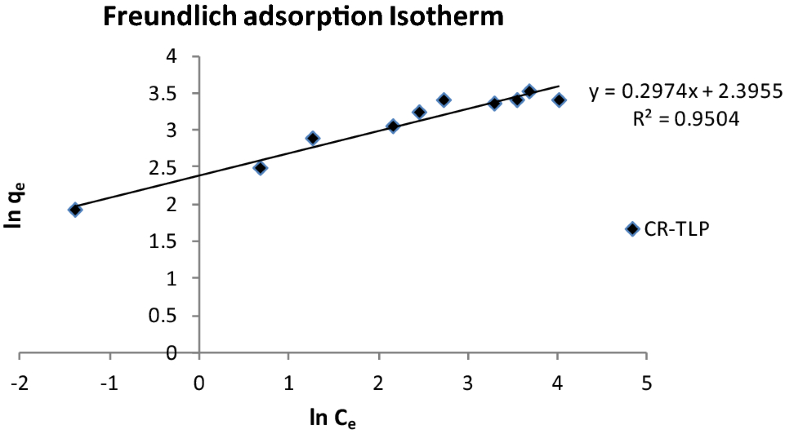 Figure 15 shows the Langmuir adsorption isotherm and the values of qm and KL were obtained from it. 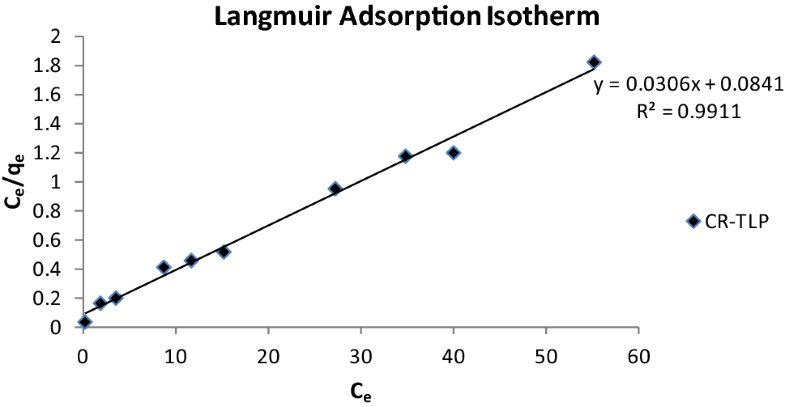 From Langmuir isotherm, the maximum sorption capacity (qm) was found to be 33.33 mg/g. Also, the significant value of the correlation coefficient, i.e., R2 = 0.991, confirms the suitability and applicability of Langmuir isotherm due to the monolayer and equal distribution of CR dye on the adsorbent surface. The value of KL, i.e., 0.3572 L/mg, was then used to calculate the separation factor (RL) (Hu et al. 2010). The calculated value of RL was observed to be 0.5847, indicating highly favorable adsorption process. 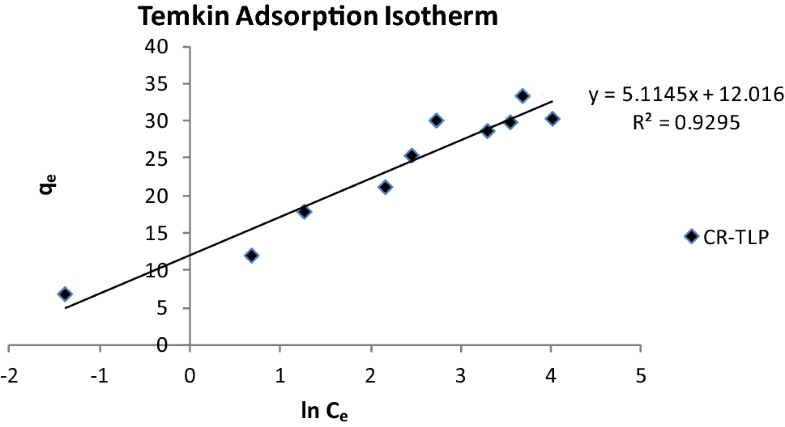 Similarly, the Temkin isotherm highlights the equal distribution of binding energy over the adsorption sites, thus supporting the Temkin isotherm. The Temkin isotherm constants B (12.39) and A (1.497) were obtained from the plot of qe versus ln Ce as shown in Fig. 16. Correlation coefficient R2 was found to be 0.929 which is lowest compared to other studied isotherms indicating its poor applicability. Table 3 shows the comparative analysis of R2 and other values and highlights that Langmuir isotherm is the best-fit isotherm. 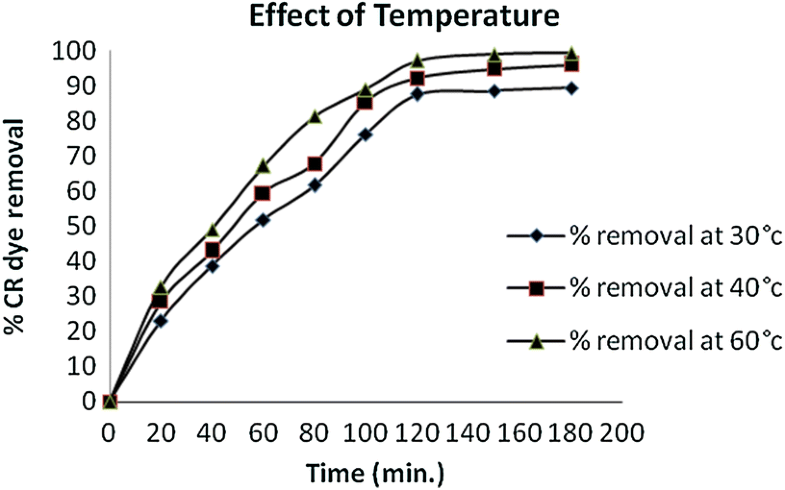 Thermodynamic parameters such as ΔH, ΔS and ΔG were used to explain the variation in dye removal efficiency with temperature (Srilakshmi and Saraf 2016). These parameters were evaluated using Eqs. 8, 9, 10 and 11. The calculated values of ΔH, ΔS and ΔG, as well as other calculated parameters, are given in Table 4. The positive value of ΔS highlights increased randomness at solid or solution interface during the adsorption and also signifies an increase in the degree of freedom of the adsorbed species, thus favoring adsorption of CR dye. The results were in agreement with earlier findings (Ribeiro et al. 2012; Dawood and Sen 2012; Reddy et al. 2012). The adsorption process was influenced by physical, chemical characteristics of adsorbent and experimental conditions. During the present investigation, various kinetic models which include pseudo-first and second order, Elovich kinetic model, Bhattacharya–Venkobachar kinetic model and intra-particle diffusion model were investigated in detail. The pseudo-first-order kinetic model was explored by using an equation of a log (qe − qt) versus t at different temperatures. The pseudo-first-order rate constants, i.e., k1 and qe, were obtained from the graph of ln (qe − qt) versus t as shown in Fig. 17. 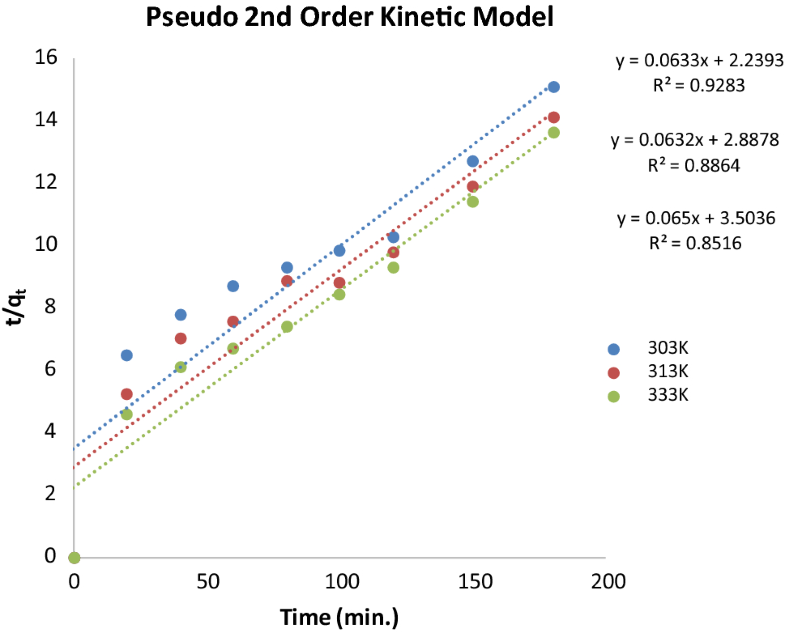 During pseudo-first-order kinetic model, the observed correlation coefficient (R2) values were very low (0.778–0.904), which highlights that the pseudo-first-order kinetic model did not significantly effect the adsorption of CR dye on activated TLP. 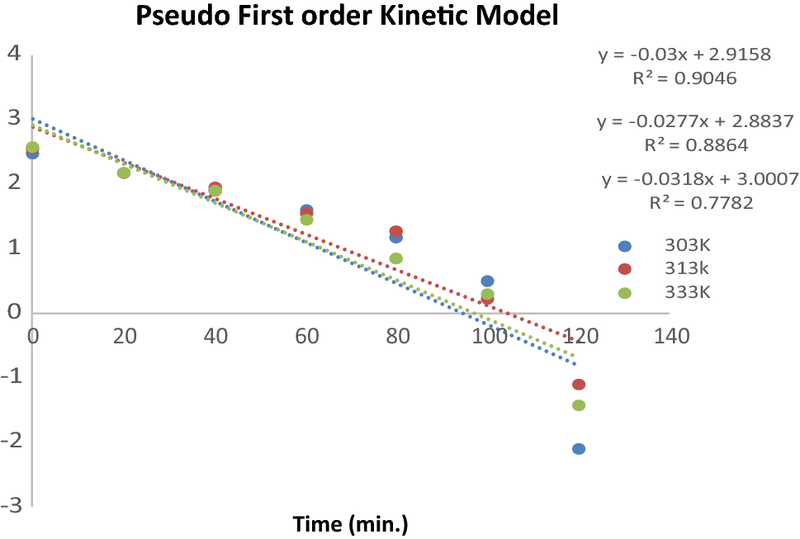 The experimental kinetic data were then further analyzed using pseudo-second-order kinetic model. The pseudo-second-order rate constants, i.e., k2 and qe, were obtained from the graph of t/qt versus t as shown in Fig. 18. The observed correlation coefficient (R2) was also very low (0.778–0.904). The calculated pseudo-first- and second-order rate constants for different temperatures conditions are given in Tables 5 and 6, respectively. It is important to note that during the study, neither the pseudo-first-order nor the pseudo-second-order model significantly describes the adsorption of CR dye on activated TLP. 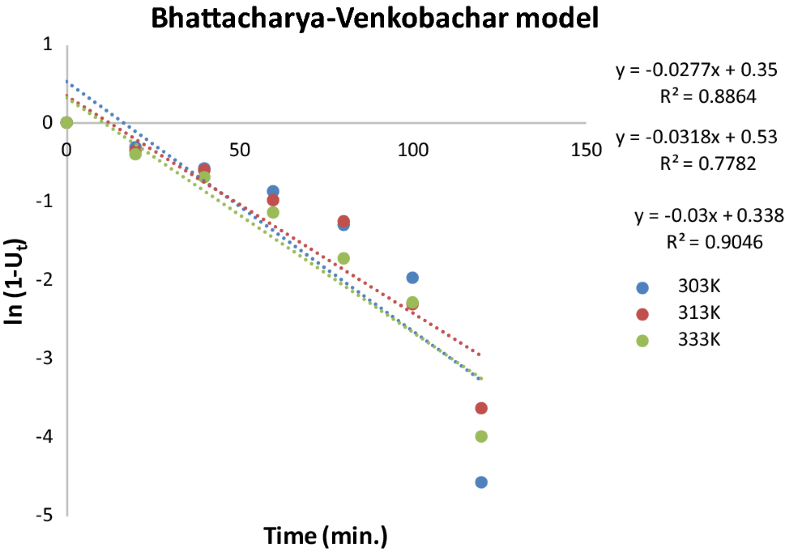 Therefore, the kinetic results were analyzed via Elovich as well as Bhattacharya–Venkobachar model. The Elovich model can be studied using Eq. 12 (Oladoja et al. 2008). where qt is dye amount adsorbed at time t (mg/g), α is adsorption rate at the initial (mg/min. ), β is the extent of surface coverage as well as activated energy (g/mg) and t is contact time (min.). The Elovich constant values, i.e., α and β, were determined from the slope and intercept of the graph shown in Fig. 19 with correlation coefficient (R2) values in the range of 0.965–0.972. 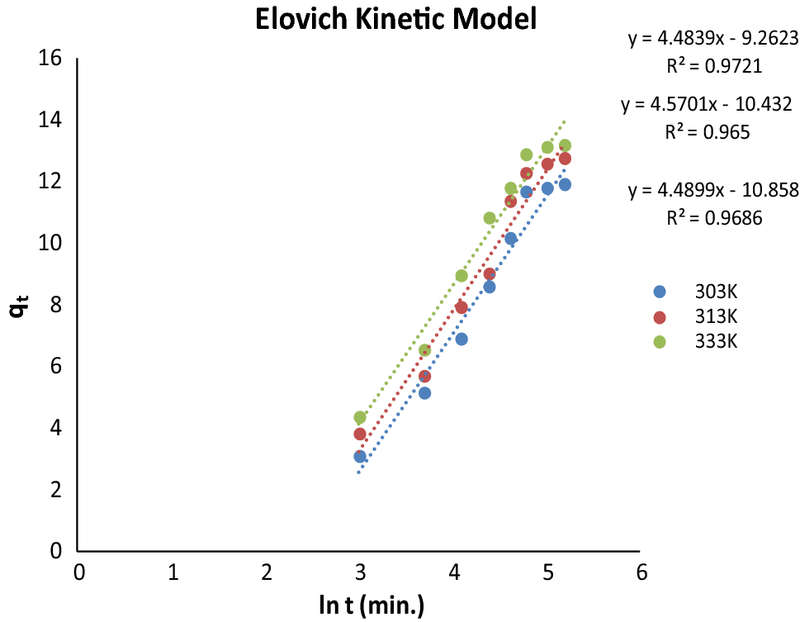 The model confirms the suitability and applicability of Elovich kinetic for CR dye adsorption. where kB is the rate constant, r is the particle radius (m), C0 is the initial concentration (mg/l), Ce is the equilibrium concentration (mg/l), Ct is the equilibrium concentration at time t (mg/l), Ut is the Bhattacharya–Venkobachar constant, D2 is an effective diffusion coefficient, t is the contact time (min) and π is the mathematical constant. The Bhattacharya–Venkobachar rate constants (kB) for adsorbent at different temperatures were determined from the graph as shown in Fig. 20. The value of the correlation coefficient (R2) was observed in the range of 0.778–0.904, which shows that the model is not fit and suitable for CR dye adsorption. Furthermore, the intra-particle diffusion model was also used as shown in Eq. 15 (Weber 1972). where qt is the dye adsorbed quantity at time t (mg/g), k is the rate constant of the model (g/mg/min), Ct is the equilibrium concentration (mg/l) and t is the contact time (min). The intra-particle diffusion rate constants, i.e., k and Ct, at different temperatures were determined from the slope and intercept of the graph as shown in Fig. 21. The values of the correlation coefficient (R2) ranges from 0.929 to 0.951 for CR dye as temperature varied from 30 to 60 °C. 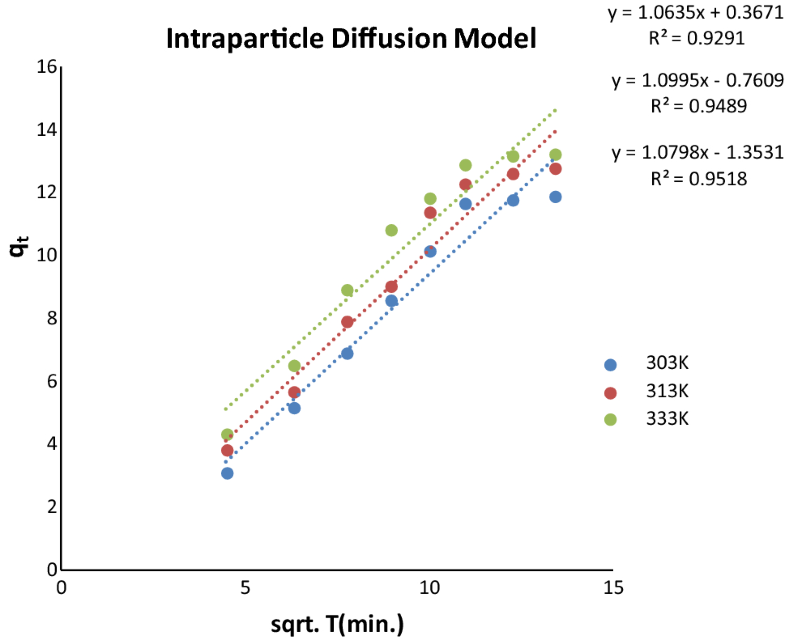 The significant values of correlation coefficients confirm the suitability and applicability of intra-particle diffusion models. The present investigation explores the effect of various physicochemical factors on adsorption efficiency along with kinetic, thermodynamics and equilibrium studies. It was observed that the percent removal of CR dye increases with increasing adsorbent dosage and subsequently decreases with an increase in initial dye concentration. The percentage removal of dye found to increase initially with temperature and then show no further significant increase in uptake. Equilibrium isotherms were studied for Langmuir, Freundlich and Temkin isotherm. However, the correlation coefficient (R2 = 0.991) value was observed to be best suitable for Langmuir isotherm. 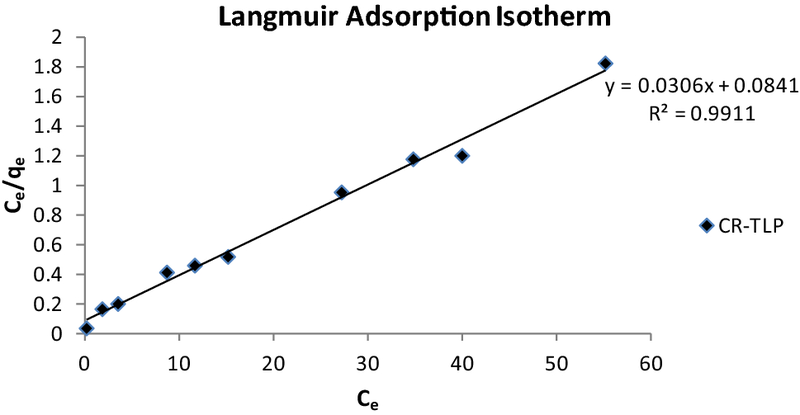 The Langmuir adsorption isotherms observed to be the best fit suitable with adsorption capacity of 33.33 (mg/g). The adsorption kinetics was also determined via pseudo-first- and second-order model, Elovich model, Bhattacharya–Venkobachar model and intra-particle diffusion model. The Elovich and intra-particle diffusion models were observed to be best fit suitable based on the correlation coefficient values. The findings of the thermodynamic study also indicate that the adsorption of CR dye on activated TLP was feasible, spontaneous and endothermic in nature. Results of the present study indicate that activated TLP has a potential for removal of CR dye. Furthermore, the feasibility and the practical use of TLP as an effective adsorbent need to be explored in detail. The authors would like to thank Director, National Institute of Industrial Engineering (NITIE), Mumbai, India, for support to conduct the research studies.